With lime green booths covered in mini cactuses alongside shelves topped with crates of oranges, True Food Kitchen lives up to its self-proclaimed sustainable health food paradise. Located in Lenox Square, True Food Kitchen has a total of 23 locations, which range from Dallas to Phoenix. It prides itself on being a “health-driven, seasonal restaurant,” and has a menu that “rotates regularly to let guests experience great-tasting ingredients at the peak of their freshness,” according to its website. Although the menu is curated to healthy eating, options range from from vegan dishes such as the Teriyaki Quinoa bowl, to heartier dishes like the Lasagna Bolognese. I started with an iced tea, the “Hangover Rx,” a mixture of pineapple, orange, honey and coconut water. Despite its appealing presentation with a leaf hanging off the side of the cup, I couldn’t help but scrunch up my face from the sour taste. In the future, I would save the $5 and stick with water instead. When the waitress brought out our first appetizer, the Heirloom Tomato and Watermelon salad ($9), I was happy to cleanse my palate with smooth feta cheese and fresh fruit. Both the watermelon and tomatoes were extremely fresh and juicy, tasting as if both were picked directly from a garden. Before I knew it, I was scraping the last of the cheese on the plate into my mouth, trying to gather each crumb of macadamia nut before my entree came out. For my entree, I ordered the Grilled Chicken salad ($14), and within several minutes of devouring my appetizer, a colorful salad filled with medjool dates, dried cranberries, jicama apple, manchego, farro and almonds was sitting in front of me. The chicken, served steaming hot, was cooked to a perfect temperature. It was covered in champagne vinaigrette, leaving my mouth watering after each bite. Not only that, but the trend of fresh fruits continued, as even the dates tasted juicy and flavorful, much like the thinly sliced apples that seemed to melt in my mouth. 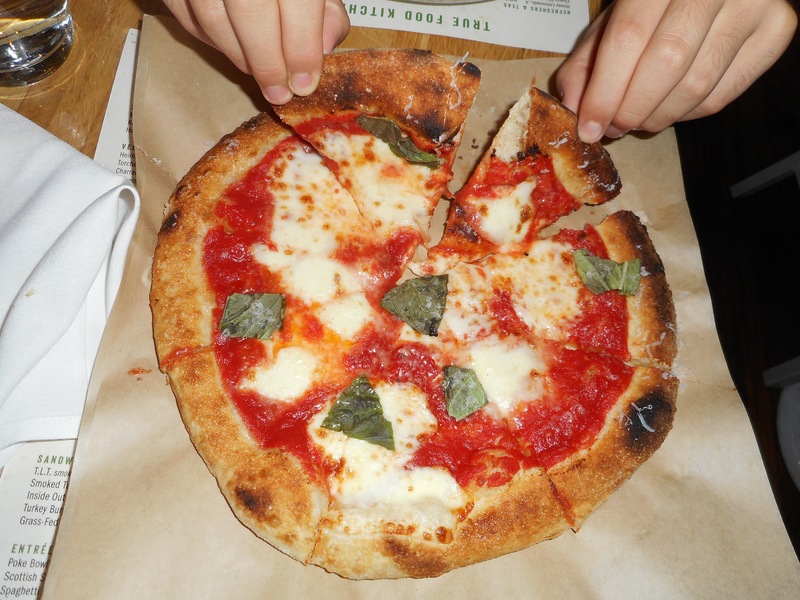 For another entree, my friend ordered the Margarita pizza ($12), serviced with organic DiNapoli tomato, fresh mozzarella and basil. The thin crust pizza was covered in piping hot chunks of cheese, and while it was delicious, it kept sliding off onto his plate, turning the dish into more of a mess than he had expected it to. From this, I learned quickly that fruits and vegetables are more flavorful than the rest of the items on the menu. We were better off sticking to a slice of New York pizza. The dessert menu was limited, only offering five items, including Key Lime Pie and Chia Seed Pudding, which to me is not dessert in the first place. We ordered the Flourless Chocolate Cake, served in a small mug with caramel and vanilla ice cream. I wasn’t sure how the restaurant would put a healthy spin on a chocolate cake, but the cake was miniature and topped with cacao nibs. The cake itself was mediocre, and it would have been held together better had it been made with flour. When I first heard about True Food Kitchen, I expected a quaint cafe filled with customers awaiting takeout midday, post Soulcycle. To my surprise, the restaurant was actually the size of a P.F. Chang’s China Bistro, with nicely-dressed couples on dates. I was quickly greeted by an enthusiastic waiter, wearing a shirt that said “Green Goddess,” accompanied by other smiling faces wearing shirts that read, “Honest,” “Shine on” and “True.” Despite the overwhelming size of the restaurant, every inch was decorated in something green or organic looking, contributing to its healthy-food vibe. String lights and chalkboards that read, “Food the way it should taste,” created an atmosphere of positivity for healthy eating. With remarkably fast service and fresh healthy food, True Food Kitchen is worth the trip off campus. The watermelon salad (4.5/5 stars) is definitely a must have, but would I recommend another dessert place for afterwards. The food was filling but did not have us feeling stuffed, a quality which is hard to find in most Southern restaurants. In terms of price, it matched most upscale restaurants in Atlanta, and I felt the cost was worth it knowing that the food was produced organically and sustainably.